After the amazing afternoon we had at the Ohinemutu Village learning about the indigenous people of this country we were all very excited to have a chance to be immersed in their culture and learn even more. Tonight we headed to the Tamaki Maori Village where we were treated to an evening of great food, fun, education and culture. It all started as we boarded a bus in town that took us to the Tamaki Maori Village. During the 20 minute drive our driver kept us well entertained as he prepared us for the evening to come. During the trip we were tasked with choosing a “Chief” for our tribe. It should come as no surprise that Dan was voted in for this job. I may or may not have had a little something to do with it as when we were getting on the bus I happened to casually mention to the driver that he should watch out for Dan…you know, being a retired law enforcement officer he is likely to be a bit unruly. The next thing you know Dan was dubbed Chief of the Takahan tribe. Upon our arrival at the village our driver took a moment to teach Dan the proper way to greet the village Chief. In Māori tradition the greeting is to touch noses and foreheads while shaking hands and saying “Kia Ora”. As you’d expect, Dan followed his instructions to the letter. We disembarked and headed into the entrance of the village where all of the other tribes were gathered. The six Chiefs were called to the front and given instructions as to what to do when the village warriors and the Village Chief arrived. The crowd was instructed that during the welcoming ceremony we were not to smile, laugh, talk or move about. Any of that would be considered disrespectful to the villagers and you could be asked to leave. Before we knew it there were village men coming out doing their traditional war like dances while swinging sticks and making that well known face that includes sticking their tongue out and down. Then there was a distant chanting that grew louder and louder. Off the the right is a small stream and soon we saw a traditional waka, “war canoe”, come into view with several more village warriors. They all came on shore and began their traditional dance. One of the warriors placed ferns on the ground in front of each of our Chiefs. This is a symbol of friendship and is to be taken very seriously. In fact the Chiefs were told that if at any time this peace offering were to touch the ground it would be seen as an act of war. At least that’s how it would have been back in the day. The Chiefs were then asked, one at a time to come forward and take the fern. They had been instructed not to turn their back when they walked away and to remain very stoic. The whole gist of this big ceremony is for the villagers to intimidate their guests so you don’t want to look frightened, rather equally tough. After the presenting of the fern the Tamaki Village Chief came out to greet the tribes. This is where the greeting of tapping foreheads and noses came into play. It appears a bit strange when you first see this but we’ve seen this happen all over New Zealand. It’s not just an ancient tradition, it’s one the Māori people still do today. Next came the real fun, the Haka! A haka is a ceremonial war dance that is really pretty cool. The point again is to intimidate your opponents. To see one of the coolest hakas ever you should click here to watch the Māori All Blacks rugby team do theirs. It’s actually known as the best haka in the world. After the haka we were invited into the village. Each tribe was instructed to go to a different station. At each station we were told about different aspects of Māori village life. 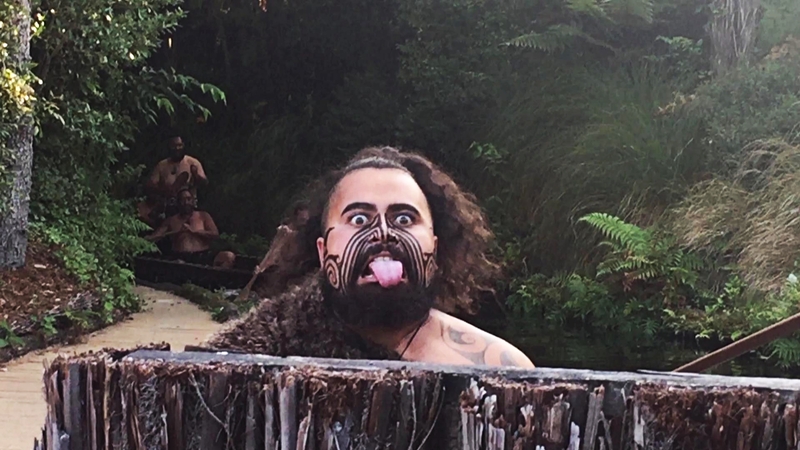 One place spoke of their history, another of living conditions, one had women illustrating the use of the poi (pronounced poo ē), another station taught the men of the group how to do a haka. Each spot was a wonderful learning experience where they allowed us to participate. It was really very interesting. As we reached the end of the village tour we were taken to the area where they had prepared the evening’s meal. The meal was prepared in the traditional way in an underground oven called and umu. They heat lava rocks and place them in the bottom of the pit. Then they lower the food down in large baskets. This included potatoes, Kumara (sweet potatoes), onions, carrots, chicken, lamb and beef. They cover the food up and allow it to cook for many hours. The result is very tasty, smoked meat and vegetables. While they were moving the food into the fale (meeting house) we were treated to a wonderful dance performance by the villagers. They performed several dances and sang some of their traditional songs. It was definitely quite a treat and since Dan was on of the honorary Chiefs of the evening we got a front row seat for the performance. Yes, it pays to know someone high up. From there it was off to the fale to have a wonderful dinner. The food was served buffet style and it very good. After dinner they had a going away ceremony for one of the village women. She had just taken a job with Disney World and would be leaving the following day. They performed a special haka just for her. It was very moving to watch as she teared up at the gesture. After that it was time to get back on the bus for the ride back to town. Along the way Dan gave a speech to the tribe, we can 100 Bottles of Beer on the Wall and the bus driver regaled us with jokes and stories. He even drove around one round about three times just for fun! We certainly enjoyed our evening greatly. To be honest, it was not a cheap evening out. It was $130 NZD per person. That’s approximately $90 USD. No, not an inexpensive evening but certainly one we will remember for a lifetime and that is what it was all about. We highly recommend this experience if you are ever in Rotorua. You won’t regret getting a chance to meet the amazing people of Tamaki! We’ve one more day of exploring here in Rotorua so check back in a day or two for more of our adventures here.